I have a confession to make. I was really only drawn to this book because of it's BEAUTIFUL cover. I know. Bad form, Miss Em. But seriously, look at it. It's gorgeous! Interesting factoid: The River of No Return is also the name of a Marilyn Munroe film, as I discovered on searching for this image! Embosses with gold, this large book jumps out at a person from a shelf or display, and I think it's going to be a runaway hit for the second half of the year. And deservedly so! Nicholas Davenant lives a lie. Single, handsome and wealthy, his perfect life is a facade constructed to hide the incredible truth- he was born two hundred years ago. Somehow, in the face of certain death, Nicholas inexplicable jumped forward in time and awoke to find himself in the care of a mysterious society. The Guild, a secretive fraternity of time travellers, helped him make a new life in the modern world. They told him that there is no return. But Nicholas yearns for home and for one beautiful woman in particular, now lost to history. Back in 1815, that very woman, Julia Percy, finds herself the guardian of a family secret: a strange talent inherited from her enigmatic grandfather. But there are those who seek to possess Julia's power, and she begins to realize she is in the gravest peril. 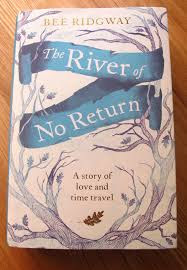 Put very simply, I think The River of No Return is what an episode of Doctor Who might turn out like if Georgette Heyer were to write the script. The strength of this book lies not in it's description of a man 200 years away from his home, but in what happens once he is returned to his own time. Ridgway has constructed a rich re-enactment of Georgian England that has the style, the history, and the proprieties to make it hum with life. When Nicholas Davenant is forced to once more become Nicholas Falcott, the Marquess of Blackdown, he finds it difficult to unlearn the ways of the future. In particular, the freedoms pertaining to women. He is accused of being a Benthamite, among other things. This becomes very relevant when the issue of the Corn Bill is thrust before him. Will Nicholas vote as Blackdown, for the interests of the landed gentry, or will he vote against his class knowing what the Bill will do to his people? What makes this book a truly great historical fantasy is its basis in fact, and the emphasis which is placed on turning points in history- things which at the time seemed like a matter of business, but over time come to change the world as it is known- in this case, causing the end of the landed classes altogether and giving rise to the merchant farming class. Others begin to notice Nick's progressiveness too. And it is not just in his past life. The Guild, an all encompassing secret society who span the breadth of time, recruit Nick for their own ends. They are fighting an organisation called the Ofan, with whom they once co-existed. Why, and over what? As Nick learns more, the more he realises that the viewpoint of the Guild is just as outdated as his own original gentrified one. But will he join the Ofan, and what will happen if he does? The contrast of the Ofan and Guild show that in life, and throughout history, there exist shades of grey in the pursuit of freedom that do not necessarily boil down to good and evil. Nothing will ever be the same again, but is this a good or a bad thing? I liked this book as well - nice review!